An RAF aid drop in Iraq had to be abandoned overnight owing to fears people could be injured by the cargo. Food and water was due to be dropped to people in the north of the country who have fled from Islamist militants. David Cameron is facing pressure to recall Parliament to discuss the humanitarian crisis in Iraq, but No 10 said a recall was "not on the cards". Amid calls for UK military involvement, Foreign Secretary Philip Hammond said he could not envisage a combat role. Mr Hammond, who earlier chaired a meeting of the government's emergency Cobra committee, also rejected calls for Parliament to be reconvened. The prime minister is currently expected to continue his holiday in Portugal. Islamic State (IS) fighters have seized territory across Iraq and Syria in the past few months, with continuing reports of the slaughter of Iraqi religious minority groups. Among those reportedly being targeted by fighters are Christians and Yazidis in the north, where thousands of Yazidi civilians are trapped in the Sinjar mountains. The US has carried out four rounds of air strikes targeting IS fighters near Irbil, the capital of Iraqi Kurdistan. The first RAF air drop of emergency supplies, including water, food and solar lanterns, to Mount Sinjar took place overnight on Saturday - but the second attempt on Sunday was aborted. The Ministry of Defence said the crew of the RAF C130 "made the responsible decision" not to carry out the air drop "to ensure that the lives of those in the area would not be put at risk". The next drop of aid is likely to be carried out within the next 24 hours. Mr Hammond dismissed the suggestion of a recall of Parliament, saying: "I don't think that's necessary at this time. We are talking about a humanitarian intervention. We have a very clear convention about consulting Parliament before British forces are committed into any kind of combat role. "We are not talking about that here, we are simply talking about a humanitarian action, stepping up what we are doing in order to support this community trapped on the mountain." He added: "We don't envisage a combat role at the present time." Defence sources told the BBC that ministers and senior commanders were considering the use of RAF Tornado jets to assist the relief operation. The jets would be used in a reconnaissance role to help transport planes deliver aid supplies and not for air strikes, a source told BBC defence correspondent Jonathan Beale. Conservative MP Conor Burns has urged a recall of Parliament, saying he did not know whether the Commons would support military action in Iraq but it was "worth trying". "These are brother and sister Christians and this is happening to them in no small part because of our record in Iraq," said the MP for Bournemouth West. "I feel very strongly that the government's response is not hard enough or strong enough. 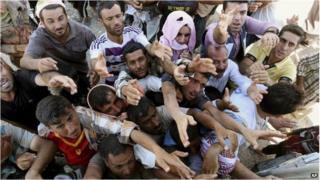 "These people are being beheaded by people from IS, and our only response is to drop some food or water on them. "I think the US and UK should be involved in air strikes. I am not by any means advocating a ground war but I think we should put our special forces in there." Ex-army chief Lord Dannatt also backed a recall of Parliament, saying "this is not the moment for decision-makers to be on holiday". He said UK troops might be needed on the ground to help support US military air strikes. He said the West could not watch a genocide take place: "If we do nothing and wring our hands later and say once again, 'We shouldn't have let that happen,' then I think we have all let ourselves down." Downing Street insisted the government was focused on the humanitarian effort. A spokeswoman said Mr Cameron remained "very much engaged" while on holiday in Portugal and "is managing to set out how he thinks the government should be responding and issues we should be looking at and considering". Iraqi Kurds have appealed for international military aid to help defeat the Islamist militants. Mr Burns said the UK should be "answering positively" requests from the Kurds to arm them, and that asylum should be offered in the UK. Former British army commander Col Tim Collins called for a "unified front" against "the evil of the Islamic State". He said help should be sent in the form of training for resistance fighters to improve their tactics and provide security for communities under threat. Media captionFormer British army commander Col Tim Collins: "The Islamic State are slaughtering their way through communities and must be stopped"
Former armed forces minister, Andrew Robathan MP, told BBC Radio 4's World at One that just offering aid was insufficient in the face of the threat from IS militants. He said: "By all accounts, these are pretty brutal, barbaric people who are murdering, slaughtering, beheading, crucifying people in their path apparently. "We have to realise it is no good just sending aid: the real solution is to stop these people and hopefully allow the Iraqis and Kurds to feed [civilians in northern Iraq]." Who, what, why: What happens when airdrops land?